We see the number four manifesting with the tangible and foundational aspects of creation. In nearly every corner of the world, the number four represents the number for the final product of creation. In the Greek mythology, it is the number of Jupiter, ruler of the protection and justice, organizer of all that was created. Symbol of the totality, it is considered by the initiates as the root of all things. The number of the double duality, two plus two, and of the universal measure, according to the Pythagorean. Represent the sense of the revelation, the stability, according to Saint Jerome. Saint Ambroise sees in 4 a luckless number. Represented symbolically by the square or the cross. For the Amerindians, this number is the perfection: the prayers are repeated four times, the dances have four count tempo, and the warriors do four pauses before to rush on their enemies. Symbolizes the Earth, or what is terrestrial, the totality of created and revealed, according to the Bible. Symbolize the incarnation of the beings in the matter. Symbol of the feminine or the woman, for anatomical reasons: the four lips on the body of the woman. The number of the force, this symbol is often reproduced on cotes of arms. The number of the balance. In Japan, the four brings misfortune. They avoid to pronounce it because the same word means “the death”. The four evangelists of the New Testament: Matthew, Mark, Luke, and John. The Jews knew four archangels to govern the angelic world. The number 4 is used 279 times in the Bible. In the Bible, 12 numbers are used 4 times. There are the numbers 31, 37, 39, 72, 112, 128, 137, 430, 450, 666, 1254 and 600000, and 4 numbers are used only in the Revelation: 144, 1260, 144000 and 200000000. The Buddhism is based on the four truths taught by “Cakkya-Mouni”: “Kou”, the pain exists in the birth, the old age, the disease, the attachment, etc. ; “Tou”, it is the sharing of all the creatures: its origin is the thirst of existence, pleasures, power; “Mou”, the man must be liberated by the annihilation of the desire; “Tau”, the means to arrive at this setting free is the practice of the “eight branches of the noble path”. The Buddha made four travels which are symbolized by the Four Gates. The four Hebraic letters forming the name of God: YHWH. Four segments of the holy cross. According to visions of Ann-Catherine Emmerick, Four kinds of wood which were used for the construction of the cross of Christ and also Noah’s Ark: the palm tree, Olive tree, cedar tree, and cypress tree. According to visions of Maria Valtortathe, four Roman executioners who crucified Jesus on the Calvary. Four letters I.N.R.I. “Iesus Nazarenus Rex Iudaeorum” engraved on the cross. Christians interpret this as “Jesus the Nazarene, King of the Jews”. Occultists attribute another sense to it: “Igne Natura Renovatur Integra” The Nature will be Renovated by the Fire. Jesus remained four years in the temple of Juggernaut in Indies, according to the Gospel of the Aquarius. The return to Nazareth of Mary and Joseph lasted four days after that Mary had remained three months with Elizabeth, according to visions’ of Mary Agreda. The four emblems of the tribes of Israel, one for each group of three: the lion, the man, the bull and the eagle. The four necessary elements for the conversion: prayer, penance, fast and sacrifice, given by the messages of the Virgin Mary at Medjugorje. The Israelites were divided into four groups when they arrived at the Red sea: one said “Let’s jump into the sea”, another said “Let’s return to Egypt”, the third said “Fight” and the last group said “Raise the voice against them”, according to writings of the library of Qumran. There are four Vedas: Rigveda, Samaveda, Yajurveda, and Atharvaveda. The four primary castes or strata of society: Brahmana (priest/teacher), Kshatriya (warrior/politician), Vaishya (landowner/entrepreneur) and Shudra(servant/manual laborer). There are four months in Islam war isn’t permitted in: Muharram, Rajab, Dhu al-Qi’dah and Dhu al-Hijjah. The Apache played a game in the old days based on their creation story wherein four Moccasins were placed about four feet apart in a row of holes in the ground on one side of camp. A similar row of holes was dug on the opposite side of the camp. the players are divided up into 2 groups representing aspects of the creation story. The players then take turns attempting to club the moccasin with a hidden bone. There are only four plays in this game. According to the Apache creation story, there was a dragon which couldn’t be killed, for he was covered with four coats of horny scales which arrows could not penetrate. In the story, a boy ends up shooting four arrows which in turn cause a layer of the dragon’s armor to fall off. The fourth arrow pierces the dragon’s heart and he rolls down four precipices into a deep canyon. Four is the sacred number of the Zia, an indigenous tribe located in New Mexico. The Hopi tribe of Arizona conducts most every sacred prayer in numbers of four. For instance, when they would pilgrimage to great bodies of water, first prayer and thanksgiving is conducted with offerings, then permission to partake of the waters. Then as if cleansing the soul by washing and drinking from the fluid of life, the water is tossed with prayer in the 4 cardinal directions as if rain clouds sent in each way to replenish the earth. The number of fundamental collections (sacred volumes of India Brahman) in which are contained the whole of the knowledge of the Veda: Rig-Veda, Sama-Veda, Yajur-Veda (or Yajour-Veda) and Atharva-Veda. The four rays of the cosmic wheel. The four pillars of the Universe. According to the Tibetans, there are four “chakras”, called also wheels, Lotus or subtle centers. The four petals of the Muladhara “chakra” located at the base of the spinal column. The Cabal distinguishes four worlds in which are the ten “Sephiroth”: the world of the emanation, Atziluth; the world of the creation, Briah; the world of the formation, Yetzirah; the world of the action, Asiah. The quaternary of the motto of the alchemists and the Rosicrucians: to know, to want, to dare, to hush. The quaternary is present in the Egyptian sphinx: head, body, paws, wings. The Pythagorean considered the quadrilateral supporting Hermes as the sign of the infallible reason. The number of the symmetry, it is used in various constructions, one of them being the “mandala” of which emerges an impression of order and discipline. Franklin D. Roosevelt declared ought to be four basic freedoms enjoyed by everyone in the world: Freedom of Speech, Freedom of Religion, Freedom from Want, Freedom from Fear. Gang of Four: Popular name for four Chinese Communist Party leaders who rose to prominence during China’s Cultural Revolution, but were ousted in 1976 following the death of Chairman Mao Zedong. Among the four was Mao’s widow, Jiang Qing. Since then, many other political factions headed by four people have been called “Gangs of Four”. There are only four mononucleotides in a DNA strand which are responsible for all genetic programming in the world. According to Hippocrates the number four governs the biological life of the man and according to C.G. Jung, it governs the psyches of the man by the four following psychological functions: the thought, the intuition, the feeling and the sentiment. The four fundamental parts of the organic chemistry: carbon, hydrogen, oxygen, and nitrogen. The four cardinal points or direction of the space: North, South, East, and West. The four phases of the moon. The four limbs of the man and the four cavities of the human heart. The four known physical forces: the nuclear, radiate, electromagnetic, and gravitational. The four blood groups: O, A, B, and AB. 0x04 is the ASCII code of the character End of Transmission, which is abbreviated to EOT. Interesting that this the fourth day was the last day God spent making the Heavens and Earth. In his book “Superior Mathematical Puzzle”, 1968, the American engineer Howard Dinesman indicates a magic square of order 4 (its side comprises four numbers) a little special, whose sum gives 264. 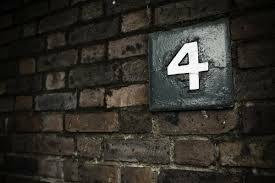 The number four and its successive multiples are generated by the sum of two successive odd numbers (1+3=4 where 1×4=4, 3+5=8 where 2×4=8, 5+7=12 where 3×4=12) or by the sum of the even number with itself (2+2=4, 4+4=8, 6+6=12). Four of Jupiter’s moons (the Galilean moons) are readily visible from Earth. The cow’s stomach is divided into four digestive compartments: reticulum, rumen, omasum, and abomasum. Most furniture has four legs – tables, chairs, etc. (It is interesting to note that 4 is one dimension higher than 3 and that we live in a 3-dimensional world. In physics, any dimension above another has the intrinsic ability to control and or stabilize any lower dimension. The wide use of rectangles (with four angles and four sides) because they have effective form and capability for close adjacency to each other (houses, rooms, tables, bricks, sheets of paper, screens, film frames). In internet slang, “4” can replace the word “for” (as “four” and “for” are pronounced similarly). For example, typing “4u” instead of “for you”. In Leetspeak, “4” may be used to replace the letter “A”. When a batter receives four pitches that the umpire declares to be “balls” in a single at-bat, a base on balls, informally known as a “walk”, is awarded, with the batter sent to first base. Four is the most number of runs that can be scored on any single at-bat, whereby all three baserunners and the batter score (the most common being via a grand slam). In basketball, the number four is used to designate the power forward position, often referred to as “the four spot” or “the four”. The interval of a perfect fourth is a foundational element of many genres of music, represented in music theory as the tonic and subdominant relationship. Four is also embodied within the circle of fifths (also known as the circle of fourths), which reveals the interval of four in more active harmonic contexts. “Four calling birds” is the gift on the fourth day of Christmas in the carol “The Twelve Days of Christmas”. Four provinces o Ireland: Munster, Ulster, Leinster, Connacht. Four estates: politics, administration, judiciary, journalism. Especially in the expression “Fourth Estate”, which means journalism. The Beatles were also known as the “Fab Four”: John Lennon, Ringo Starr, George Harrison, Paul McCartney. Four rivers in the Garden of Eden (Genesis 2:10–14): Pishon (perhaps the Jaxartes or Syr Darya), Gihon (perhaps the Oxus or Amu Darya), Hiddekel (Tigris), and P’rat (Euphrates). There are also four years in a single Olympiad (duration between the Olympic Games). Many major international sports competitions follow this cycle, among them the FIFA World Cup and its women’s version, the FIBA World Championships for men and women, and the Rugby World Cup.